This beer can design was the first of a new artist series developed for our client, Creature Comforts Brewing Company. Every can release outside of their main four beers is a collaboration between a local artist and the designer. The artist provides a piece of art work that is then interpreted and designed to fit the already established brand image. I manipulate the work to fit the can while retaining the artists hand, adding the color and type treatment to fit the beer style and overall appeal. This process starts with meeting the brewery heads, collaborating with the artist about the idea, then to the interpreting and designing process, and lastly to the printers for the final canning. The first collaboration was with tattoo artist David Hale for the much anticipated Koko Buni Milk Porter. The second was with painter Jim Barsness for the Cosmic Debris Double IPA. Click here for that can project. 1. After consulting with both the brewery and the artist, the artist is provided with the template and instructions for the artwork. Then the artist provides the work. In this case the artist followed the template pretty closely allowing for the translation of the art to the can to be a fairly fluid one, however, this is rarely the case. Check out collaboration two for a much different translation process. 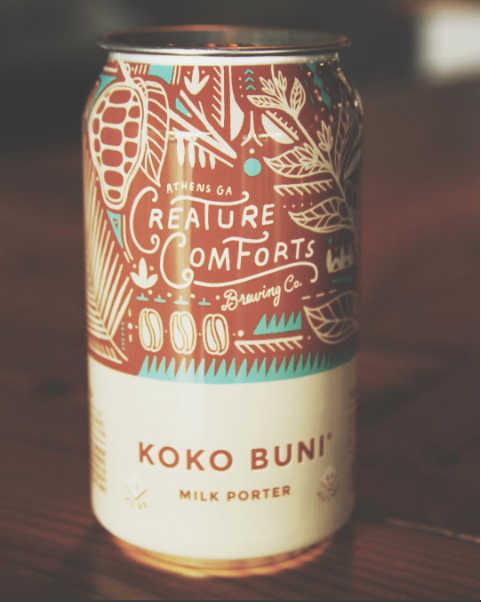 Koko Buni is milk porter with a flavor profile of toasted coconut, coco nibs, and coffee. Given that information the dark brown was chosen to represent the style of the beer (which is very dark in color) and the coco nibs and coffee located in the flavor of the beer. White and light beige were chosen for the toasted coconut and the lactose used to brew the milk porter. Last the turquoise was chosen to add a color pop to bring the can all together. These were the 3 different fonts used to create the hierarchy on the can while maintaining the Creature Comforts branding already established. 3. After color and fonts are chosen the iterations begin to find harmony between the artwork and the brand identified design. Below are some iterations that were scrapped. 4. After iterations are completed a final version is presented to the client that usually comes back with changes and then the file is solidified and prepared for print. This is the final design for the client. 5. After the can is completed, the client is happy but always wants more! In this case there was a mini brand identity designed for the beer's sales sheet, t-shirts, stickers, and chocolate bars. 6. Once this is all complete the reward is watching the community enjoy your work!